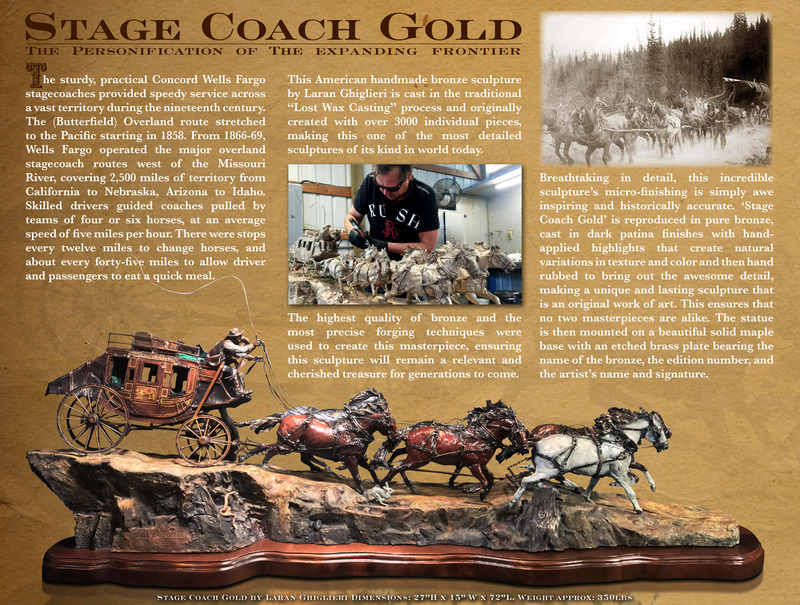 LAKE OSWEGO, Ore., Sept. 28, 2017 /PRNewswire/ -- Mark Russo, CEO of Treasure Investments Corporation commissions world-famous Laran R. Ghiglieri to create a historically accurate 1860 concord stage coach to be cast in bronze, pure silver and solid gold. This American handmade bronze sculpture by Laran Ghiglieri is cast in the traditional "Lost Wax Casting" process and originally created with over 3,000 individual pieces, making this one of the most detailed sculptures of its kind in the world today. The highest quality of bronze and the most precise forging techniques were used to create this masterpiece, ensuring this sculpture will remain a relevant and cherished treasure for generations to come. Breathtaking in detail, this incredible sculpture's micro-finishing is simply awe-inspiring and historically accurate. 'Stage Coach Gold' is cast in dark patina finishes with hand-applied highlights that create natural variations in texture and color and then hand rubbed to bring out the awesome detail, making a unique and lasting sculpture that is an original work of art. This ensures that no two masterpieces are alike. The statue is then mounted on a beautiful solid maple base with an etched brass plate bearing the name of the bronze, the edition number and the artist's name and signature. Laran's painstaking attention to detail really comes to life in his rendition of cowboys. These are hard-working, hard-drinking, weathered men. Their attire was practical for their purpose, long coats for protection and weapons concealment and large wide-brimmed hats sheltered them from the sun. Laran's horses, in particular have a lifelike grace. In teams, they strain together; yet, each animal is a unique individual. 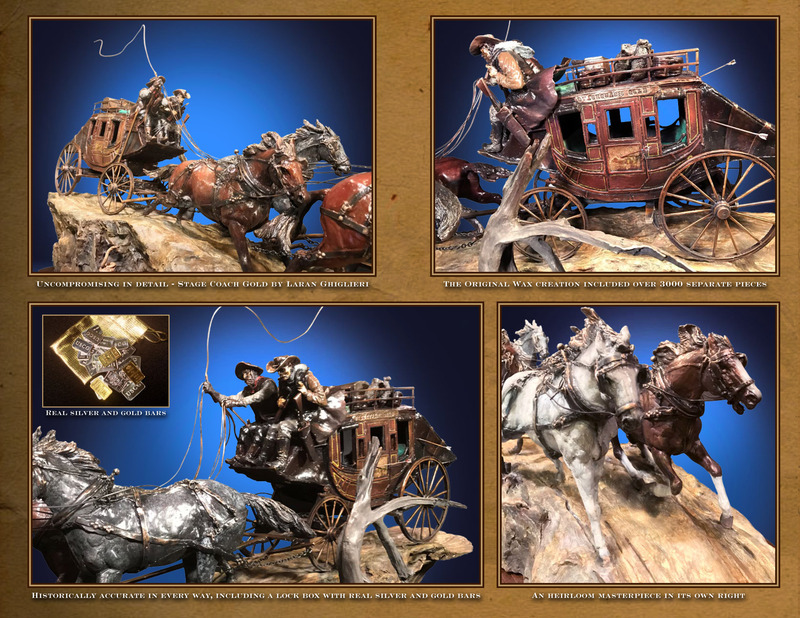 Laran spent the past year collaborating on this sculpture with Mark Russo, CEO of TIC, personifying the authentic Wells Fargo stagecoach. Inspiration and detail work was derived from months of research extracted from the original blueprints of the Concord Stage Company archives. The piece now complete and currently on display in the prestigious Paul Zueger galleries in Colorado is a limited edition in bronze of 350, 35 in pure .999 fine silver and one available in pure .9999 gold. Priced at $38,500 in bronze, $175,000 in silver and $7.5 million in gold, this one piece has the potential of generating over $25 million in revenue for Treasure Investments. This one new image adds to TIC's 700 plus existing molds and pieces in its asset base and mold collection. "We are excited to have commissioned this next great piece by Laran Ghiglieri for our extensive art collection," says Russo. "Ghiglieri is an American world-class sculptor who follows in his family's tradition of creating sculptures that are of fine artistic quality and excellence." Ghiglieri is the son of sculptor Lorenzo Ghiglieri, whose sculptures have been owned by celebrities, presidents and even the Pope. Several of the Ghiglieris' works are included in Treasure Investments Corporation's collection of more than 700 original works of art. The company's mold collection was recently appraised at more than $900 million. Russo is in the process of preparing an Initial Public Offering (IPO) for Treasure Investments Corporation in 2018. Currently, Treasure Investments Corporation has no debt and has successfully completed its first round of equity finance of $1 million. Russo also just recently purchased a new office building for the growing business. The new building is located at 808 SE Commerce Ave in Battleground, Washington. With a focus on philanthropy, Treasure Investments Corporation provides high-end limited-edition bronze sculptures for charity fundraising events as well as creates and distributes its world-class images to fine art galleries in the United States. Through Treasure Investments Corporation's charity auction division, millions of dollars in revenue have been raised for nonprofit organizations. Treasure Investments Corporation provides valuable bronze castings to nonprofits for their galas and other charity fundraising events with no upfront cost. Then the company provides the nonprofit 50 percent of the final bid price with no strings attached.